It’s a cringeworthy statement of ignorance. “I want to be number one in Google” is a classic example of business leaders not understanding something, but wanting it anyway. I’m no expert in SEO tactics, but I do know that before you worry about search placement, you need to have a website and content that people want to use and read. There is no point in bringing people in, if there is nothing of value for them to do. You also have to set aside your ego. Just because you work with computers, doesn’t mean it’s worth trying to place well with “computers” in search. Work with a knowledgable SEO expert to determine a humble and realistic SEO scheme. There are basic things that can be done to a website while designing and building it to improve placement in natural search, but there isn’t any magical line of code to accomplish the task. Improving search position comes from creating great content that people want to read, and will link to. It’s a simple statement, but very difficult to achieve because in order to do it, you have to cut through all of the noise out there. Sometimes it’s downright impossible. If you are looking to place well for “computer,” the competition are businesses like Dell and Apple. The bottom line is that it’s hard work to earn a good search position. If you don’t want to work hard, and you want great placement in Google, you can always buy your spot through Adwords. It’s not natural search, but you can get yourself high placement in return for money. You might notice a company called “Bergen Computer Shop” on the right of this image. That company has no hope of placing well against it’s competition in a natural search for “computer,” but paid advertising gives it a fighting chance. It is possible to game Google. To trick them into placing you better, but doing so comes at great risk. When JC Penny’s deceitful search engine optimization scheme came to light, Google took action and bumped them way down. One of the biggest rules of running a website is, “Never make Google look foolish.” In the longrun, it is never worth it. I think I figured it out. OK how do you JCPENNY did not just pay big bucks for pay per click advertising. 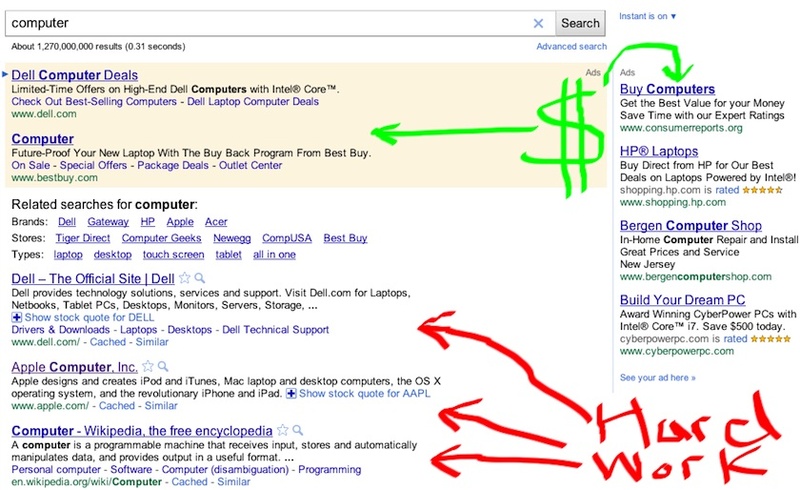 Pay per click would place them in the advertised section of the results page, not at the top of natural search.